Results for 6th May 2017. Apologies for the delay in the results. Another record turnout this week of 230 finishers. Unfortunately there were a lot of alterations including barcodes failing to scan and alterations due to someone doing only one lap. The results were processed but failed to go through. They will be resent early Sunday morning when we gain access to the Centre which is now alarmed. For many this was the first parkrun of the year. In the morning parkrun announced they had taken 10,002 new enrolments in one day, so we expected a few new faces. In the end we had 165 runners with 27 first timers. Maybe more because 10 others forgot barcodes or didn't have time to print them off. We did lose 4 finish tokens. REMINDER, please don't take the finish tokens home as we use them each week. We can replace them but it does take time, thanks. If you have them please return them. You wont be the first or the last. 3rd Dan Slipper of ELR in 19.40. Female placings:- 1st Courtney Hyde 21.02, 4th parkrun, debut at Wanstead. 2nd Felicity Price Thomas of ELR in 22.41,. 3rd Suzanne Bench of ELR in 23.48. Congratulations to Ciaran Canavan reaching his 100th parkrun, also Emmet Fitzgibbon and Rachel LeRoux there 50th runs. Congratulations to Jack Goodwin celebrating his Birthday at parkrun. Thanks to the volunteers for there assistance, looking good for January but if you can assist during February it will be appreciated. See you soon, Don Bennett RD. Welcome to the four newcomers to parkrun who joined us this morning: hopefully we'll see you again next week. Also welcome to the 13 visitors who joined us for the first time today - from Penryn and Belfast to Valentines and Hackney. Hope you enjoyed our course today (even if it was backwards!). Hope to see you all soon; enjoy the rest of 2016 and hopefully 2017 will bring you a PB. Or, at least, cake. Christmas Eve at Wanstead Flats parkrun had 145 finishers with 11 first timers and 12 pbs. Congratulations to Tricia Handley and Julian Paterek-Cotton, both reaching 100 parkruns. Male placings this week were:- 1st Tomaz Plibersek 16.25 2nd Tom Phillips 16.36 3rd George Day 16.39 pb. Ladies placings this week were: 1st Siobhan Reddy 21.31 2nd Kavita Solder 23.33 3rd Francesca Everson 23.34. Thanks to this mornings volunteers for your assistance. Hope to see some of you for our reverse Christmas Day run at 9.00am. Tea & coffee with some sweet treats will be available afterwards. Don't forget our New Years Day run at 9.00am and if you want to go to Valentines or Hackney Marshes at 10.00am, please plan your route to the run and drive carefully. Merry Christmas and a Happy New Year for 2017 from Paul, Tony, Liz, Mike , Barbara and myself. Today's run was in glorious sunshine, great conditions except a bit chilly for those standing around. We reached a milestone in our finishers with the 25,000th finisher crossing the line. We had 134 runners with nine 1st timers and 23 new pb's taking part with two XC fixtures affecting the attendances. Male placings were as follows: 1st Adam Kirk-Smith 15.46, 2nd Darren Southcott 16.31 and 3rd Tomaz Plibersek 16.51. Ladies placings were 1st Ula Cartwright-Finch 19.14, 2nd Siobhan Reddy 21.44 and 3rd Hannah Millwood 23.24. To celebrate our 25,000th milestone we had a few biscuits and chocolates for the 25,000th and every 25th finisher following that. 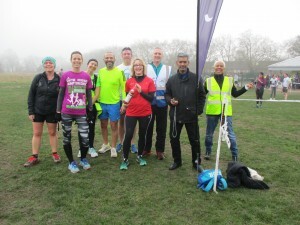 Our 25,000th finisher was 18th place, Oliver Bushdari, 16 parkruns all at Wanstead Flats followed by Joanna Rolfe (20), Oliver Howard (18), Geoffrey Martin (16) and Suzy Solley (13). All have done 83 parkruns between them at Wanstead Flats. Just a reminder please that young children must be accompanied by an adult for safety. This is an open forest area and you never know who is about. Some parkruns have been known to pull unaccompanied children from the run and we don't want to resort to that. Thanks to all this mornings volunteers for your help, the run cannot happen without you. Things are looking good up to Christmas Day with volunteers with New Years Day needing assistance soon. More details to follow soon on those events. A new parkrun website will appear early 2017 with an iconic picture to represent each parkrun. If you would like to submit a picture to represent Wanstead Flats then contact the office and we will forward the brief to you. The picture must be submitted by the 6th January to parkrun HQ. In the meantime lets have plenty of 50, 100, 250 and other official shirts at the runs. Another change at the end of February is the Points Table will end. Some new regions of parkrun worldwide have launched without points and Bushy parkrun has already dropped the points system. Don Bennett RD Event 293. Well done to Minaxi PATEL and David Wyatt today on their 100 parkrun! Apologies for any wait at scanning today; one of our scanners is playing up and will need replacing or servicing [so delays likely for a couple of weeks]. Please be aware there is only ONE tail runner volunteer position each week unless one of those runners is a junior that needs to be supervised. Otherwise thank you all for volunteering. For London Marathon 2016 volunteers, the draw for the guaranteed entry will be held on Nov 5th. Today was our 288th event. By coincidence Jan 1st will be our 300th event IF this year we have a Christmas Day [Sunday 25th] run as well as the usual New Year's Day run. We will ask for a show of hands of interest next week. It was great to see so many faces this morning for our fifth anniversary event. Especially newer participants and those bringing their families. First time over the 200 finishers mark, on a reverse route day. Congratulations to Maud and Scott on finishing first in the annual points competition.[again]. Thanks for all the cakes and edible goodies everyone. Thanks to all the volunteers especially those that came to help move the tree stump [again]. If you can help in the weeks ahead please let us know.